Banoffee pie is a classic English recipe made from bananas, whipped cream, and toffee laid on a base of crumbled biscuits and butter. 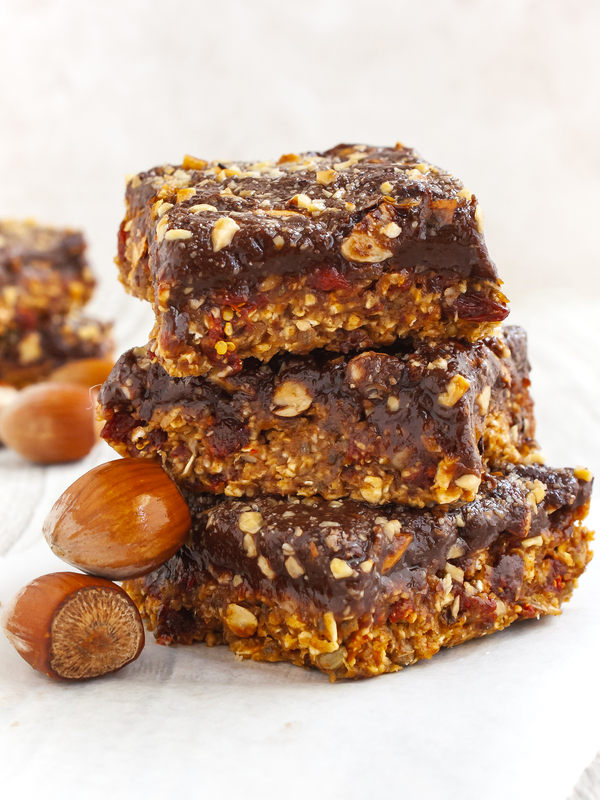 It’s a fantastic mouth-watering dessert, but it’s also high in refined sugars and saturated fats. 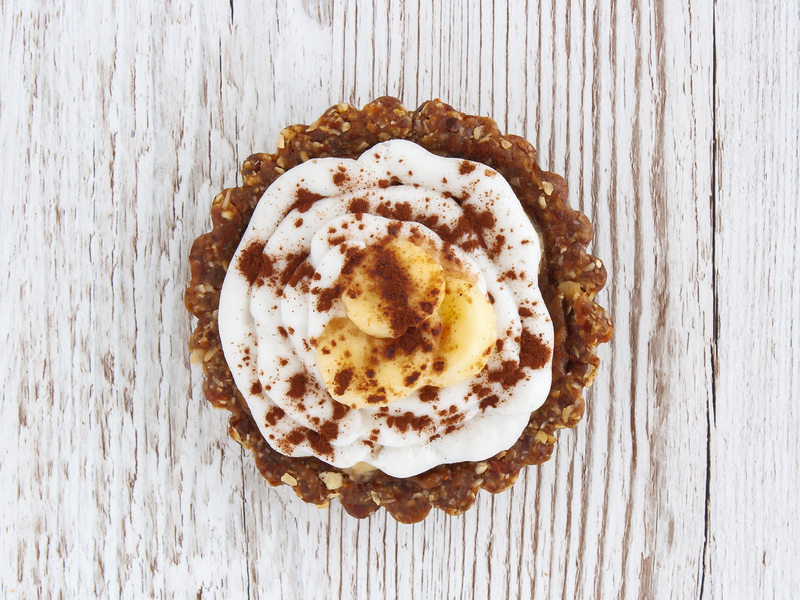 As our mission at Foodaciously is to help everyone enjoy their favorite food without compromise, we have made a healthier version of the banoffee pie that is dairy-free, gluten-free and vegan. 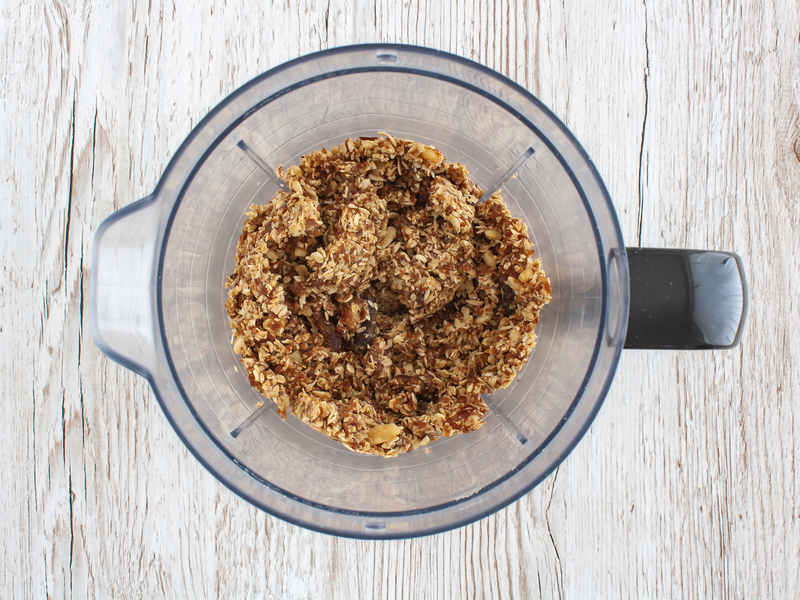 In fact, this easy recipe is prepared with dates, oat, and nuts, all nutritious base ingredients high in fibres and low in saturated fats. This banoffe pie has no refined sugars, just a drizzle of honey in the almond cream. Awesome! To make things more interesting, this dessert is served as a tart instead of the classic pie, perfect if you want to prepare single serving desserts for a fancy dinner. 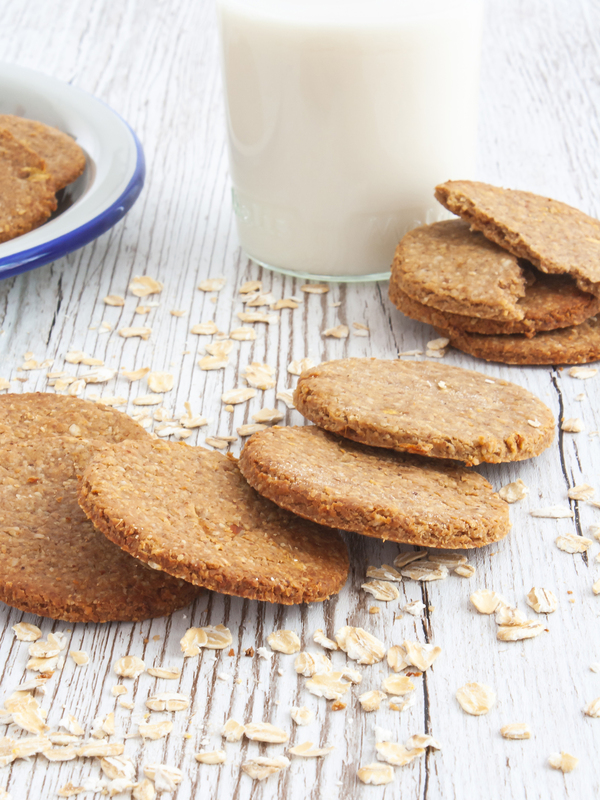 Base Crust made from dates, oat, and nuts instead of biscuits and butter. Toffee Layer prepared with dates blended with a hint of vanilla and a pinch of salt, instead of butter, white sugar, and condensed milk. 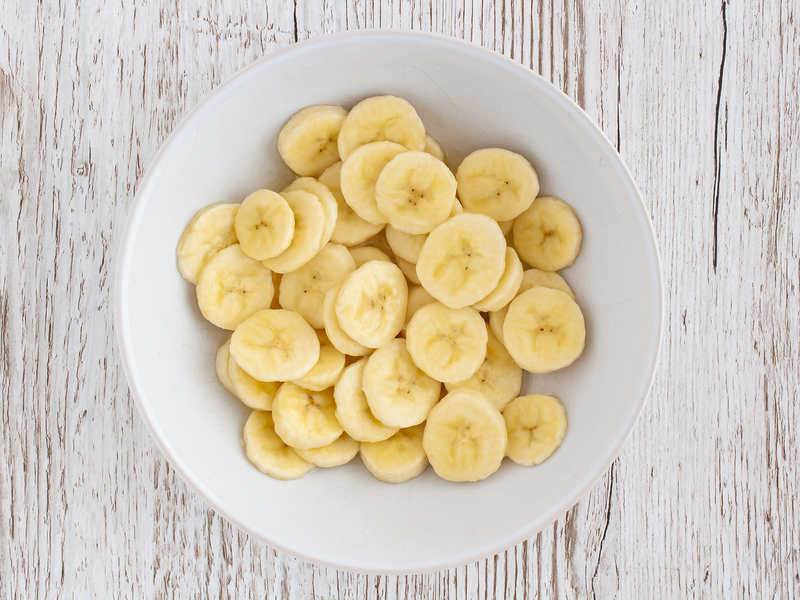 Banana Chips marinated in lemon juice to add freshness to this sweet treat. 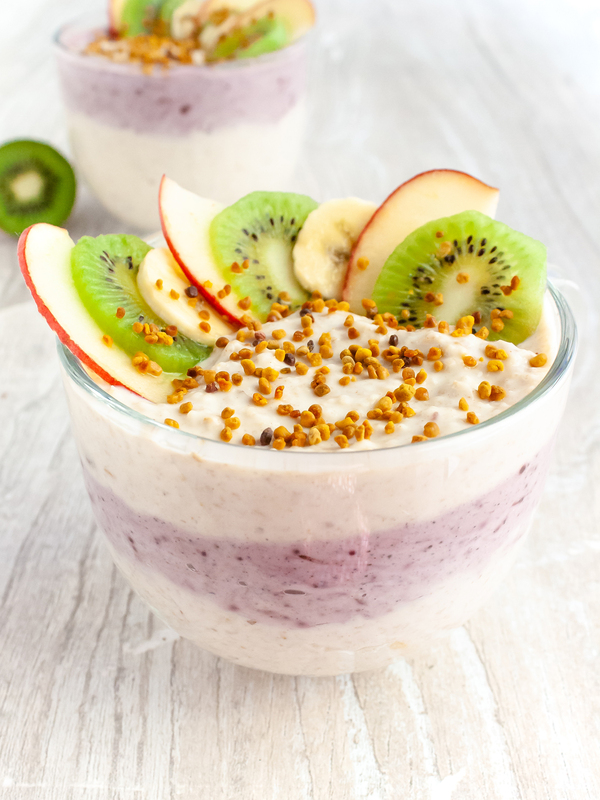 Almond Cream prepared with almond milk and honey resulting in a much lower content of saturated fats compared to the classic whipped cream. We have tried using coconut cream as a topping but we have found its strong coconut flavour to cover the other ingredients. Also, using coconut cream increases the calories and saturated fats of this dessert which is already a very generous treat, so keep things lighter with a delicate almond cream. 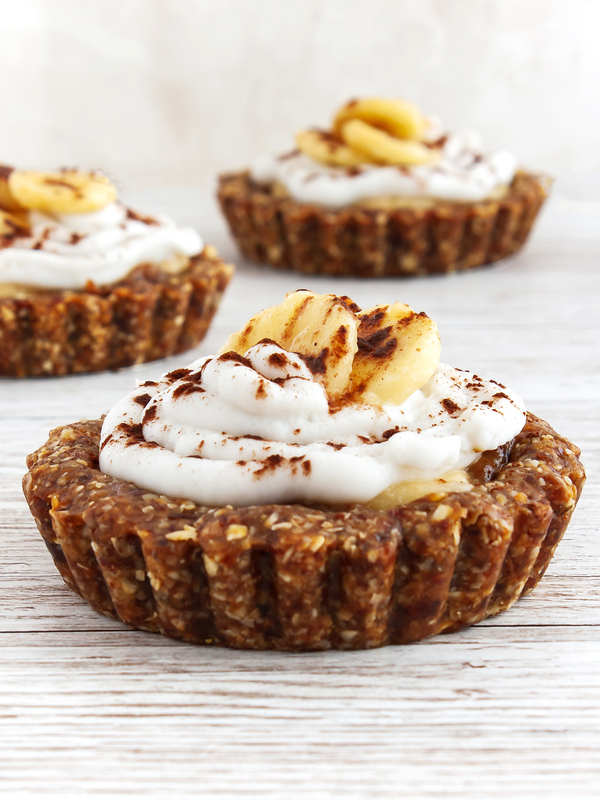 Thanks to these healthy substitutions, these sugar-free banoffee tarts provide 1/4 of your recommended intake of fibres plus all the benefits from oats, nuts, and banana. Note: the default amounts yield 4 large banoffee tarts of 10cm (4 inches) and each tart can serve 1 or 2 people. 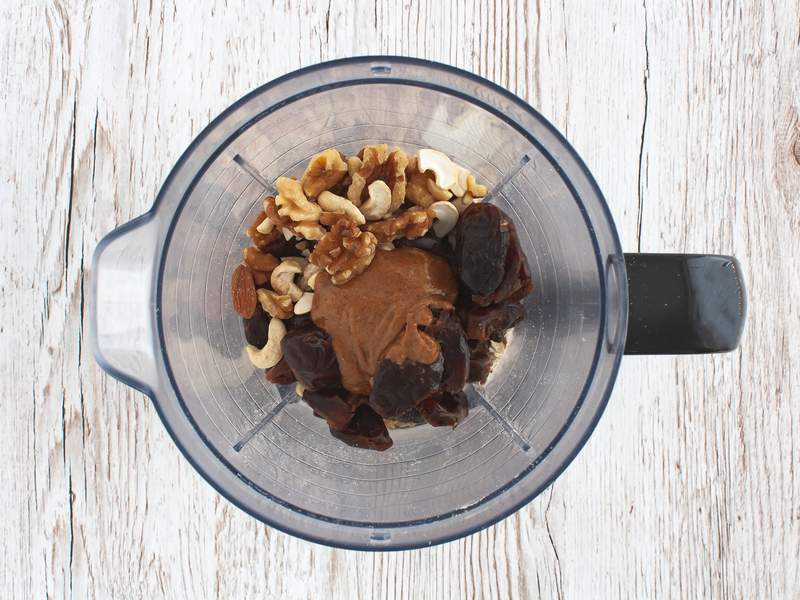 To prepare the gluten and dairy-free base of the pies, add rolled oats, 185 g of pitted dates, mixed nuts, oil, and 20 g of almond butter in the blender bowl (1). 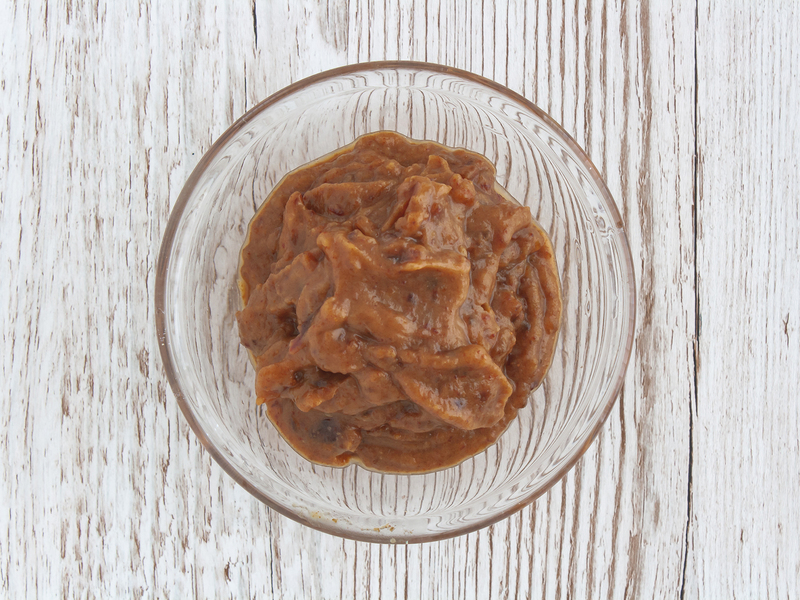 Blitz until the oat and nuts are grounded and the dates have formed a thick and sticky paste (2). 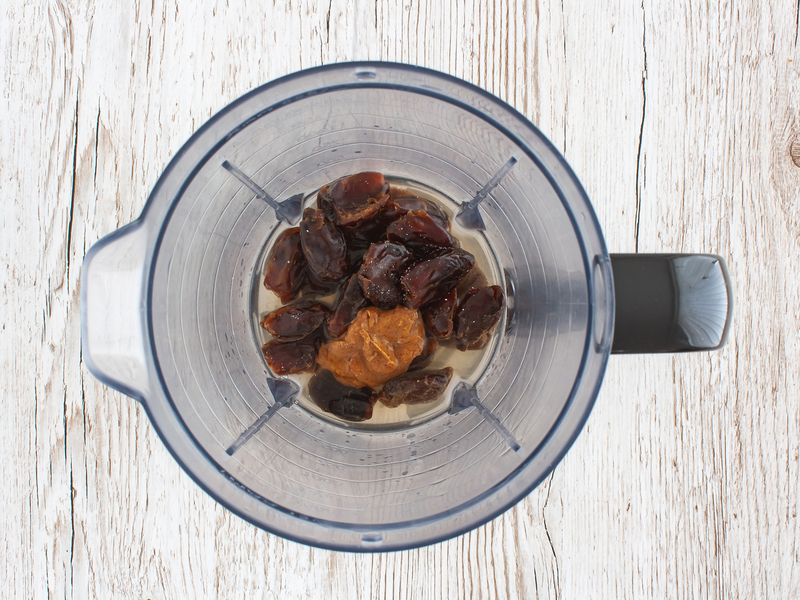 Transfer the oat and date dough into a clean bowl and knead it until the ingredients come together. Roll the dough into as many balls as the number of servings (1). Line 10cm (4 inches) tart tins with cling film to remove easily the pies later on. For each tart, flatten down one ball of oat and date dough pressing it with your fingertips toward the bottom and the edges (2). Place the tart bases in the fridge to cool down and keep their shape. 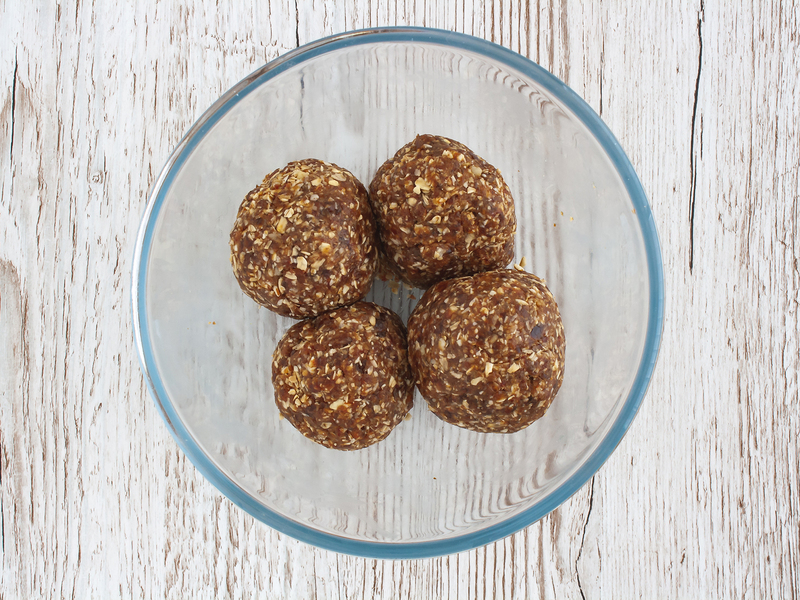 In the meantime, prepare the sugar-free toffee by adding 115 g of dates, water, vanilla extract, 10 g of almond butter, and salt in the blender bowl (1). Blitz the ingredients until you have a smooth paste (2). Next, slice the bananas into chips and drizzle with lemon juice using a lemon squeezer (1). 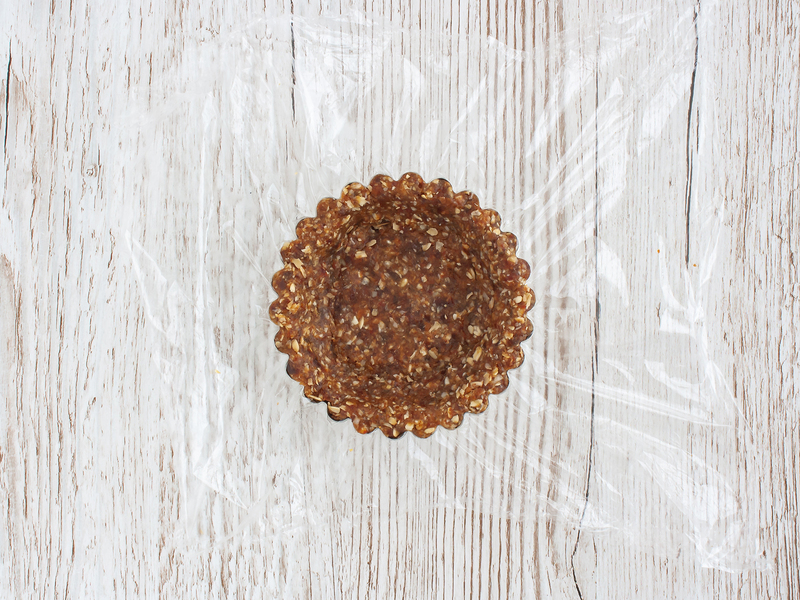 Remove the tart bases from the fridge and evenly spread the toffee among them. Then, line the toffee layer with banana chips, saving some for decoration (2). 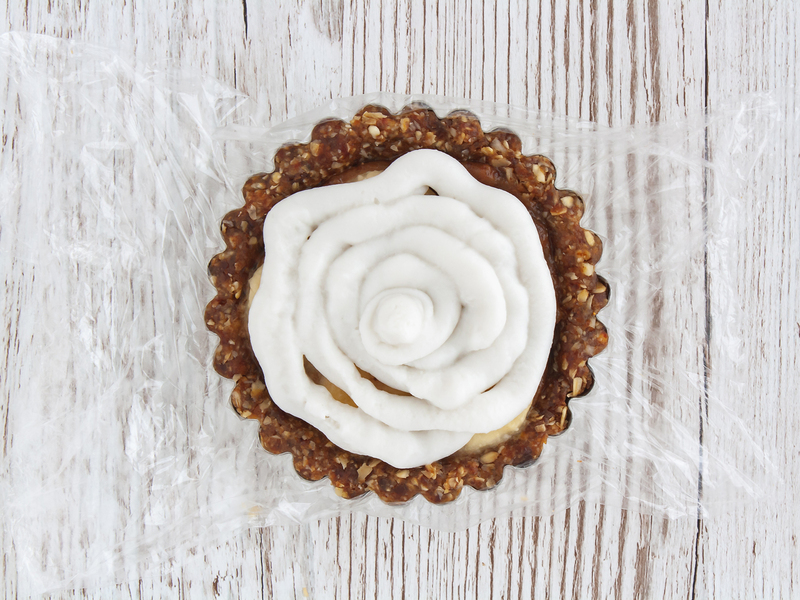 Spoon the almond cream into a frosting bag and pipe over each tart to cover the banana layer (1). Finally, garnish the banoffee tarts with banana chips and dusted cacao powder (2). 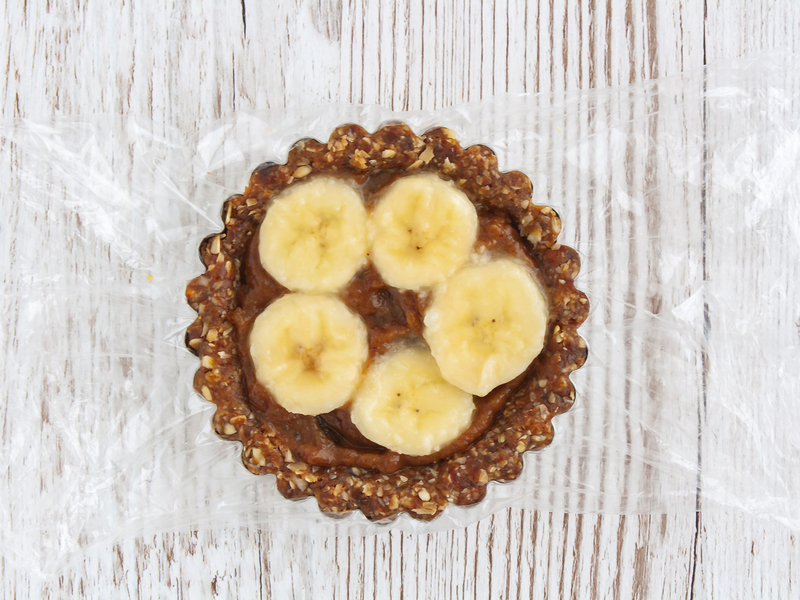 Keep the banoffee pies in the fridge before serving and store them in an airtight container for up to 2 days.